Dawn, I can see that you have a tiny bathroom and this shelving worked for you, but I’d be agonizing over the possibility of having stuff fall in the toilet! Are all of you real good at keeping the lid down? That would not happen here I don’t think…so stuff would get knocked, bumped right over into the toilet…:( Yuck. Has it ever happened? Not much actually. We keep the toilet seat down. That shelf is really MY shelf and I mostly utilize it after I shower and I make sure the seat is closed in case anything falls. But in the 5 years I have been living here, I have have only had things fall in the toilet a couple times. I have to put up with a few accidents I suppose in order to stay organized. There is nowhere else I can put the shelf unfortunately. I appreciate your comment. This is such a great idea. I have a like a huge jewlery box (I think that’s what it is) that I got from walmart to put my stuff in. Even with it open my bathroom still looks organized. Love the organization tips regarding the hair clips! I have use that one. I have a similar setup to yours with shelves over the toilet. I use lots of baskets from Michaels that I buy at 1/2 price sales to keep makeup, hair brushes and hair care products in. That keeps the area from looking too cluttered. The shelf idea is great! I actually have one in our toilet room off of the bathroom that I have only been using to store magazines & toilet paper. However, I see myself utilizing the shelves/space more efficiently! 😀 The drawers for the hair clips & ties is great!! & also baskets (that the above poster mentioned) …. Great!! Tips! Thanks for sharing! Interesting idea. 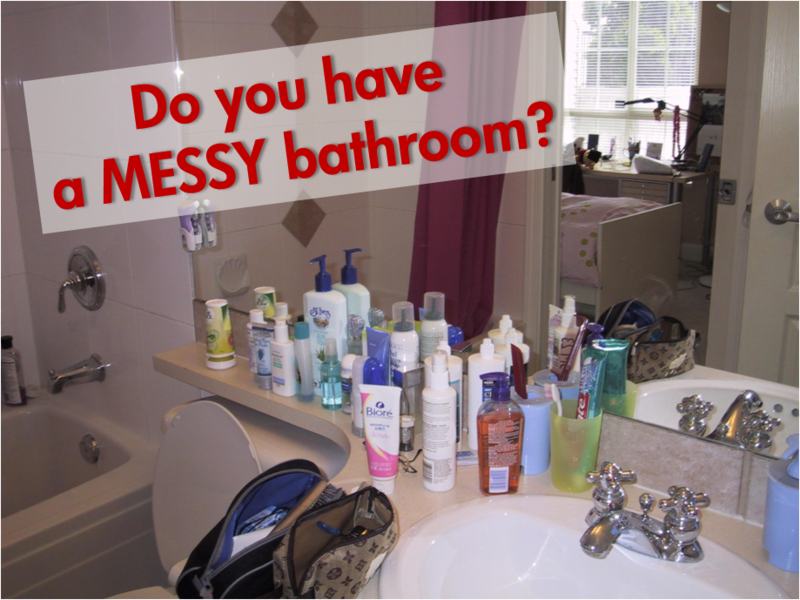 It is really important that your bathrooms is well organized specially when you have visitors. What a fantastic way to keep orgainized!! I too have a very small bathroom, with absolutely no shelves or cuboard under my sink! I have been looking for one of those shelves that fit over the toilet but I like your idea so much better. can you please tell me where I could get a similar shelf? Any info would be greatly appreaciated! Thanks! Great post, I myself love to organize my bathroom accessories and it is good to be organize it reflects on who you are in person and it makes you feel more comfortable using your bathroom when your things are all organize. Great for me that I found your Blog… I just started with my own Blog, can I reference to this post? I want to write something on similiar topic! Jennyb´s last blog post ..I got started to blogging!